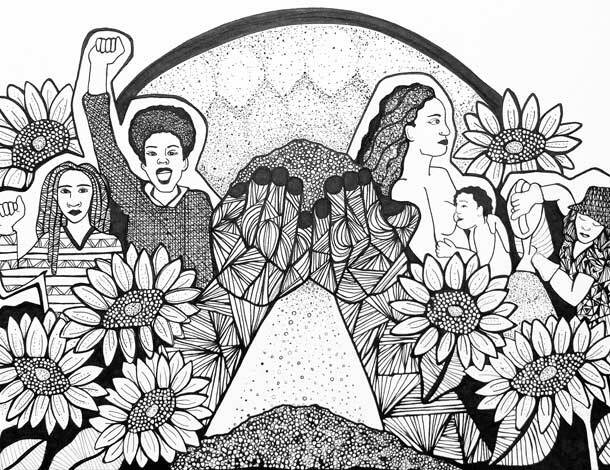 On Tuesday 28th February, AWID and the Gender and Development Network (GADN) co-organized a webinar to discuss what kind of transformations we need to make gender, economic and ecological justice a reality and prepare feminist activists for the 61st Commission on the Status of Women (CSW) taking place 13-24 March 2017. Over 80 activists working on labour rights and the informal economy, women human right defenders, popular educators and global governance took part. 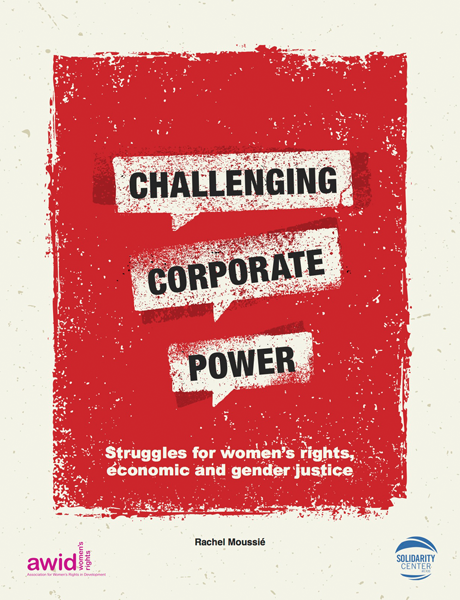 Together, we formulated key steps for limiting the power of transnational corporations to infringe on women’s rights – and reclaim the debate around women’s economic justice from a human rights and feminist perspective. Provide adequate universal social protection: Economic justice is not just for those in paid employment. Universal social protection is critical for alleviating poverty and providing a basic level of wellbeing to everyone, but particularly to women who are most affected by the absence of these protections and most likely to be excluded from work-based provision. Governments should set, and enforce, minimum wage levels sufficient for workers to attain their right to an adequate standard of living and should ensure that employment regulations and social and legal protections are extended to cover workers in the informal economy, where the majority of women work worldwide. Protect freedoms of association and collective bargaining: These are fundamental labour and human rights for women as well as men. Trade unions and women workers’ organisations must be empowered to ensure women’s work is safe, secure and fairly remunerated. Collective action can play a major role in improving women’s access to decent work. Governments should ratify ILO Conventions 87 and 98 – and protect these rights within their own borders. Address violence at work: All forms of violence and harassment in the workplace must be prohibited by law. This is still a significant and shocking legal gap that leaves women workers vulnerable – and all the more so when they face losing their jobs and livelihoods for reporting abuse. Governments should support the proposed ILO convention on gender-based violence in the world of work and ratify Convention 189 on domestic workers. Affordable, accessible and high-quality public services are critical for alleviating women’s disproportionate burden of unpaid care work. It is also essential that this unpaid care work be included in national accounting measures like GDP. Governments must commit to deploying a “care lens” in all areas to properly examine and mediate the effects of their policies and programmes on women’s unpaid care work, while pursuing comprehensive social services and infrastructure to reduce women’s workloads. Climate change has direct consequences on food security, livelihoods and the level of unpaid care and domestic labour required, which disproportionately falls upon women. A just transition to post-carbon or low- carbon economies is necessary to mitigate these impacts. Consumption taxes place a disproportionate burden on women, but progressive taxation is possible with reforms that shift the load to high-income individuals and corporations. Regressive taxation models also contribute to a narrow tax base and thus to the underfunding of public services that perpetuates women’s disproportionate responsibility for unpaid care work. Governments should carry out impact assessments to understand how changes to policies in taxation, social services, public-sector investment, infrastructure and other areas affect gender equality and women’s rights and livelihoods. Data should account for diversity amongst women – urban or rural; low- or high-income individuals, households and regions; women of colour, indigenous women and migrant women. Ensure that all corporations, transnational companies, the financial sector and extractive industries pay their fair share of taxes to the governments of countries where their economic activities occur. Corporations must be held accountable when they fail to respect and protect basic human rights of their workers, subjecting them to low wages and dangerous working conditions. Governments should support the UN Human Rights Council working group in developing legally binding regulations to ensure that all corporations respect and promote human rights, including women’s human rights, and ecological impact assessments. International trade agreements have a profound impact on the quality and amount of work available to women. Governments must protect women’s rights against export-oriented labour exploitation, land appropriation and resource extraction based on a better understanding of the gendered impact of trade policy. Current trade and investment agreements and International Monetary Fund policies constrain and proscribe government policy choices. Space for governments to choose alternative social and economic policy options should be created and protected. Governments must reassess what macroeconomic policy is for – and direct their macroeconomic decision-making, from taxation to debt management and monetary policy, towards economic justice, human rights, environmental sustainability and wellbeing for everyone.8 Transformative change cannot be achieved with technical tweaks; real change necessitates a substantive shift in how we design and execute economic policy.